As our Dana-Farber Marathon Challenge team members train for the Boston Marathon®, we set out to learn more about nutrition during this grueling training period. Stacy Kennedy, MPH, RD, CSO, LDN, a senior clinical nutritionist at Dana-Farber Cancer Institute and American College of Sports Medicine certified fitness specialist, was a member of the DFMC team in 2003 and ran the B.A.A. Half Marathon® in 2018. Find some meal ideas and tasty recipes here. Q: Is there any difference in the foods you should eat in the early stages of training compared to closer to race day? A: Consult with a registered dietitian to create a customized meal plan that will enhance your marathon training experience! It’s not all about the pasta dinner the night before a race. I tend to think of marathon training in three phases: the tempo, the build up, and the taper. The tempo are the early runs you are doing that require high speeds and low time commitment. These are days where a balanced snack such as Greek yogurt and some fruit might be good pre-workout fuel to make sure to maintain good energy. The build focuses on having enough energy in the meals before long runs (carbs) and enough recovery in the meals after (protein). The taper is all about maintaining weight (vegetables and protein) and increasing hydration. Focus on eating a little more in the three days leading up to the marathon. As you increase your mileage with training, overall nutrient intake should also increase to support your run and recovery days. Q: How much water or fluids should runners drink when training? A: The Academy of Nutrition and Dietetics recommends that individuals follow a customized fluid replacement plan that takes into account: thirst, urine color, fluid intake, sweat loss, and body weight changes during exercise. Remember: Fluid needs differ among individuals. Work to meet these fluid guidelines on a daily basis. This is a more effective approach than trying to load up on hydration the day of your training run. Water is the perfect hydration source for training sessions less than an hour. When over 60 minutes, add an electrolyte beverage or tablet to your water. Load up on electrolytes the day before your marathon as well. Q: What should runners eat the morning of the long run? A: Pre-run snacks are ideal before a long run because they increase blood glucose levels and stored carbohydrates in our muscle, which our bodies can use for fuel during exercise. Oatmeal mixed with unsweetened almond milk, walnuts, and berries. What about 1 hour before a long run? Smoothie with protein (ex. powder, Greek yogurt, nut butter), frozen or fresh fruits and vegetables. 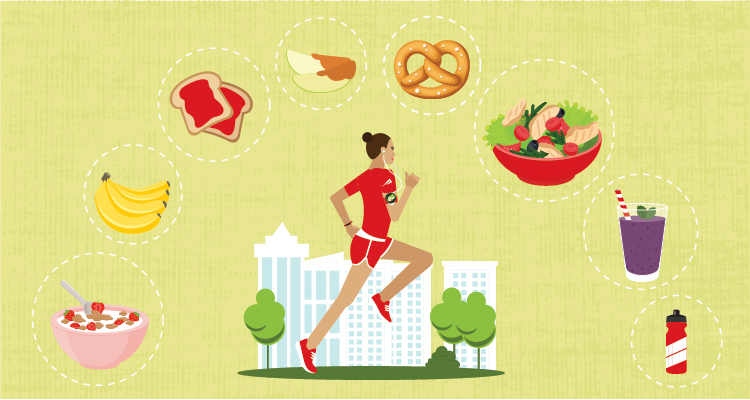 Q: What should runners eat on race day? A: The Golden rule of sports nutrition: “Nothing new on race day.” Foods eaten on the morning of a race should reflect the foods eaten throughout training. Test out your pre-run meals for the big event on your long training runs (10, 16, 20 miles) to see how your body responds. They are called test runs for more than just your clothing and shoes; they are test runs for nutrition too. * Runners are advised to stop drinking roughly 30 minutes before the start of the race. Q: Should runners eat during the marathon? A: Carbohydrate consumption at miles 13 and 20 has been shown to help runners maintain their pace without depleting glycogen stores. Some snack suggestions are: dehydrated fruits, fruit nectar, tapioca. Carbohydrate gels and sports beans with no artificial ingredients are also suggested. Q: The race is over! What should I eat? Don’t have much of an appetite post-race? Savory snacks are a great option for you! Enjoy heading to a local restaurant with family and friends after the event and enjoy a protein-rich meal. Q: Any final advice you’d like to share? Sleep and rest days are an important part of training! Check out recipe suggestions from Stacy and learn more about the Dana-Farber Marathon Challenge team’s mission to conquer cancer.